The DDA flat applicants association today demanded the resignation of union urban development minister Jaipal Reddy and state minister Ajay Maken in protest against the stance of the DDA to go ahead with allotment of flats to those whose names appeared in the draw list. It also demanded a CBI inquiry into the case. Amid allegations of irregularities in the Delhi Development Authority’s (DDA) draw of lots for allotment of flats in the capital, an unsuccessful applicant today approached the Delhi High Court seeking cancellation of the draw. after they attempted a bank robbery in Kalkaji area of south Delhi, the South East district police today claimed to have busted the gang involved in several bank dacoities in Delhi and National Capital Region. Delhi police stations will have specially trained commandos equipped with sophisticated weapons to tackle any terrorist situation. In the wake of 2010 Commonwealth Games, the New Delhi Municipal Council (NDMC) is all set to renovate two stadiums in its area to meet international standards. to be held in 2010.
the police said on Monday. On the request of private schools in the city, district magistrate Deepti Umashankar has amended her orders issued on Monday regarding change in school timings. The Haryana Janhit Congress (HJC) headed by Kuldip Bishnoi today accused the state government of not implementing the recommendations of the 6th Pay Commission in right earnest. There was a time when the Tibetan antelope Chiru used to be slaughtered en masse for wool to make expensive Shahtoosh shawls. A 25-year-old man was killed in the Capital today morning after he came under the wheels of a Blueline bus. Fog has again hit the air and rail traffic as 183 flights—both domestic and international—were delayed and 18 cancelled. The municipal councillors today met the union and urban development minister Jaipal Reddy and presented him a memorandum demanding an anti-sealing ordinance. The Delhi police on Monday rescued four girls from Sikkim, aged around 12, in two raids in South Delhi’s East of Kailash locality and arrested a woman and the owner of a placement agency. It’s one of the most common disorders, yet thyroid problems - which lead to weight issues, depression and even infertility - are the least detected, simply because people are not aware of it. A few days back, Ajay Maken said that if the scam was on a large scale, the draw would be cancelled. But Housing Commissioner, DDA, Asma Manzar, yesterday categorically said that it would not be cancelled. She has a given clean chit to the DDA. In such a situation, the ministers should resign as they are not effective, said organiser of DDA flat applicants association, Ritesh Dewan. Ritesh said that scam in DDA was a routine thing as it was reported in 1995, 1999, 2003, 2005 and 2008. He also demanded that the DDA should return the earnest money with interest. It was written in the application form that earnest money would be returned within two weeks after the draw of flats. he draw was done on December 16 but so far he had not received his money, Ritesh said. However, the Housing Commissioner said that department concerned was returning money to unsuccessful applicants. Countering the Commissioner on the issue of mobile numbers, Ritesh said that nowadays everybody kept phone number or mobile numbers. When the same number is mentioned on more than one application forms, it means that the applicants were of one family. Only one member of a family was allowed to apply for the flats, he said. Meanwhile, all India BJP general secretary, Vijay Goel said, “More than a week after irregularities in allotting flats in the reserved category surfaced, the union urban development ministry is still toying with the idea of cancelling the draw. “It has asked DDA to submit a report. The Economic Offences Wing of the Delhi police is conducting an inquiry. Taking into account the failure of the government to provide speedy justice in this case, Goel has demanded a CBI enquiry into the matter citing that it is a question of hard-earned money of lakhs of people. Rajesh Kumar, who works with the air force, filed a petition in the court that the DDA had illegally and arbitrarily allotted the flats and the draw should be cancelled. “The draw of lots made by the DDA is illegal, arbitrary and grossly against the public policy and there are sufficient proofs to show that the draw suffers from malpractices coupled with the irregular and irresponsible conduct of DDA,” Kumar said in his petition. He said many applications were filed using fake names and the authority has failed to verify these, leading to the allotment of flats to dubious applicants. “The irresponsible conduct of the DDA in not verifying the details of the applicants and then not rejecting the applications suffering from misrepresentation and suppression of facts has been highly prejudicial to genuine applicants,” he said. With the arrest of three desperate armed robbers, Mohd. Ishtyak, Majid and Ahmed Shaheed, arrested yesterday after they attempted a bank robbery in Kalkaji area of south Delhi, the South East district police today claimed to have busted the gang involved in several bank dacoities in Delhi and National Capital Region. According to Ajay Chaudhry, DCP (South East), the arrested men not only robbed a person of Rs 5.5 lakh withdrawn by him from State Bank of India, Malviya Nagar, but also robbed UCO Bank, Hauz Khas and UCO Bank, Sheikh Sarai, Malviya Nagar. According to police, the accused disclosed that they are residents of Siwal Khas village in Meerut and since they had no means of livelihood, they came in contact with one another and started committing petty thefts. Soon they purchased sophisticated weapons and started looting persons who withdrew huge amount from banks. Two of them would visit the bank and check the security arrangements, CCTV etc. When they found that the security arrangements are inadequate, two of them entered the bank and kept an eye on the persons who withdrew huge amount. They followed and robbed them on the way at the point of pistols. Using this modus operandi on January 2, they had tried to steal a Maruti car from Geeta Colony area, but the constable on patrolling duty intercepted them. They shot at him. They also disclosed to have committed snatchings and robberies in Delhi, Kaushambi, Ghaziabad and Merrut, UP. Three pistols with nine live cartridges and two motorcycles have been recovered at their instance. As many as 110 men completed the commando training on Monday while another batch of 100 men started the 45-day course. The Delhi police had started the course in December after Mumbai terror attacks with the intention of having trained men in every police station who could take charge in a crisis. Initially, the aim was to have a team of four personnel armed with AK 47s. 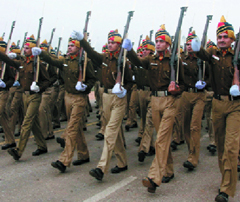 But now the Delhi police is aiming to increase the strength to at least 10 personnel in one police station. “In order to make available a group of constables who are physically fit and well trained in handling weapons, a training module has been prepared for constables in every police station till each station has at least 10 specially trained men,” said S Nithianandam, joint commissioner of police (Training). According to him, all the chosen constables are below 30 years of age and once the training is completed, they will be equipped with AK47s and MP5 machine guns. It was also revealed that Delhi police is buying more AK47s and MP5 machine guns that are used by law enforcement agencies and military across the country due to their accuracy and reliability. Delhi police has 11 districts divided into 133 police stations with 60,000 police personnel that provide security cover to a population of nearly 20 million. Nithianandam said in order to meet the requirement of well-trained commandos, particularly on the occasions of Republic Day, Independence Day and major festivals, they have designed another training module. “The first training course of 100 constables for 45 days was started in mid-December to improve their stamina, weapon training practice, knowledge of explosive, raid on hostile hideouts and modules on rescue operations,” he added. The officials are also planning to give the same training to all probationary sub-inspectors in batches of 75 immediately after completion of their training. More than 600 fresh police personnel are expected to join the Delhi police wings this year. One of the most significant works assigned to the council includes overall renovation of the indoor stadium at Talkatora Garden and Shivaji Stadium, both of which have been chosen to host boxing and hockey events, respectively, during the Commonwealth Games. “The stadiums are being renovated to meet the international standards. A new sports facility block and underground parking facility is to be constructed near the Talkatora indoor stadium,” said NDMC spokesperson. Talkatora is being renovated to accommodate 3,000 people along with a provision of parking for 520 cars. “The upgraded Shivaji Stadium will have four-storey building with a capacity of accommodating 9,000 persons and two-level basement parking,” said the spokesperson. According to NDMC estimates, the renovation cost of indoor Talkatora Stadium is Rs 150 crore and for Shivaji Stadium it is Rs 185 crore. On the guidelines of the Delhi government, NDMC had also decided to upgrade the street lighting in its area before the Commonwealth Games. “A comprehensive study was done by Delhi IIT of the existing street lighting. On the basis of their recommendations, it was decided that on all major Delhi roads the average illumination should not be less than 35 lux.,” said NDMC spokesperson. The council has already installed improved road lights over a stretch of 1.2 kilometers at a cost of Rs 43.68 lakh at Simon Boliver Marg, which was inaugurated by the Chief Minister in July 2008. However, the standardised energy efficient streetlights have to be installed in 67 other major roads in the area. “The work on street lighting on the major roads under NDMC area would be completed by the end of 2009,” he said. The Delhi government today demanded from the union government financial help of Rs 6,000 crore for preparation of Commonwealth Games to be held in 2010. This demand was made after a meeting of Delhi finance minister A. K. Walia with senior officers of the urban development. The union government has so far sanctioned only Rs 770 crore for construction of stadium and other places for games. The state government requires Rs 12,000 more for preparations. Sources said that the government hasdecided to arrange Rs 6,000 crore from its own sources of revenue. But the remaining money has to be given by the union government. Walia has also ordered an enquiry into grant of L-53 licences for departmental stores.He stated that a few discrepancies have come to his notice. Hence an enquiry is being ordered to set the things right. A senior home ministry official’s daughter, kidnapped from this Delhi suburb late on Sunday night, was found in Ghaziabad town in neighbouring Uttar Pradesh a few hours later, the police said on Monday. Meenakshi Rawat (20), the daughter of Dalip Singh Rawat, a senior official in the home ministry, was kidnapped in a car by three people while returning home in Sector 22 of Noida with her mother and a neighbour from the nearby vegetable market late Sunday night. According to Meenakshi’s mother Veena Rawat, the three were on their way home when a white Santro car with tinted windowpanes stopped a few metres from them. While one person remained sitting inside, two others came out and dragged Meenakshi into the car and drove away. In the scuffle, Meenakshi’s shawl and slippers were left behind on the road. Immediately, the girl’s parents informed the police, who registered a case of kidnapping at Sector 58 police station. While the family nervously waited for the news about the girl, the police finally found her around 3.30 am in Ghaziabad town. Noida police chief Navin Arora said that Meenakshi was found near Bhopura in Ghaziabad after the police on a lookout for the accused, chased the kidnappers’ car and alerted their Ghaziabad counterparts. Seeing the police checking, the assailants dumped Meenakshi near Bhopura under Sahibabad police station and fled. Sources, however, said that Meenakshi was dropped near Mamura Chowk and she made a call to her parents from the phone number of a boy. The police, however, denied this. Superintendent of police (city) A.K. Tripathi said that the girl told them that her kidnappers, initially three and later on joined by another man, slapped her and molested her. 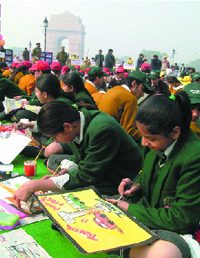 As per the new order, now the opening time for schools up to primary level, that is class fifth, will be 10 am till January 14, but classes for 6th to 12th standards can be started from 8.30 am onwards. The management of some private schools today apprised the DM about their problems in rescheduling the opening time at 10 am, to which the DM conceded. The DM agreed that the schools may fix the starting time for classes from six to 12 from 8.30 am to 10 am depending upon their convenience. The closing time for all schools will remain unchanged. Schools found violating the order would be liable for action under Section 188 of the Indian Penal Code. Bishnoi, who was here for mass mobilisation for his party’s rally slated for January 25, promised that if his party came to power, it would provide benefits to the state employees on the pattern given to the Central government employees as per the recommendations of the 6th Pay Commission. He also assured that his party government would regularise the services of 20,000 guest teachers in the state and at the same time, would also fill all the about 1,10,000 vacant posts in the state. On the political front, he said that his party had already announced the names of its nominees for two parliamentary constituencies— Faridabad and Gurgaon— and names of two other constituencies would be announced in the January 25 rally. In response to a question, he said that he was no admirer of the present Prime Minister Dr Manmohan Singh or the BJP’s prime ministerial candidate L.K. Advani. He clarified that his vote against the confidence motion moved in Parliament by the UPA government during the political situation then surrounding the nuclear deal should not be seen as his party’s support to the BJP-led NDA or L.K. Advani. His party’s stance against the Congress-led UPA government was the motivating factor to vote against the motion, he added. But today more and more Kashmiri artisans who produced these are switching to Pashmina, giving the endangered species a new lease of life. Officials said this transformation — aided by the government and community groups which are helping artisans market Pashmina — is a positive step towards protecting the Chiru at their main home in China’s Changthang Nature Reserve. In the past, these animals were killed in large numbers to obtain wool for making shawls. Chiru wool, famous for its softness and warmth, is called Shahtoosh. Fuelled by global demand, illegal Shahtoosh trade continued despite a government ban. “Today their (Kashmiri craftsmen) perceptions that higher incomes are possible only in Shahtoosh have been changed in a major way,” said Aniruddha Mookerjee of the Wildlife Trust of India (WTI), an NGO. Pashmina shawls are made from the wool of Changthangi or Pashmina goat. These goats are farmed in Ladakh and Lahaul Spiti regions of Jammu and Kashmir. The wool is combed to derive Pashmina, through a process that does not threaten the lives of goats. Each combing of an adult male goat yields 250-270 gm of wool each year during summers. Pashmina goats are also found in Tibet, China, Mongolia and some other central Asian countries. In 2001, a study conducted by WTI found that 15,000 people were directly working in Shahtoosh and 50,000 people were partially affected by the ban. Not all of them have switched to Pashmina. Some still occasionally work on Shahtoosh that still has demand in the clandestine market. “Most of these artisans are still lured by high remuneration in the Shahtoosh industry, although the production has seen a major decrease in the past five years,” said Ashok Kumar, member of the advisory committee of the Wildlife Crime Control Bureau under the Ministry of Environment and Forests. “At least five Chirus are killed to obtain the wool for making one single shawl for a man. Only the workers in the Kashmir Valley have the know-how to make the shawl,” he added. The man, yet to be identified, lost his balance while stepping down from the bus plying on route 333 from Anand Vihar to Jahangirpuri in Northwest Delhi around 10 am. The man died on the spot. “The bus driver accelerated before the man could step down. He fell on the road and came under wheels of the bus,” a police officer said. The driver was arrested. At least four people have died in road accidents involving Blueline buses since the beginning of 2009. During 2008, at least 111 people were killed by the killer buses. Eight flights were diverted and three rescheduled. Forty Delhi-bound trains are running behind schedule and one has been cancelled till the end of the month. More flights may be cancelled tomorrow as there is possibility of decreasing the level of visibility in the morning due to thick fog. But there is possibility of clear sky during the day. The maximum temperature is expected to be 20 degree Celsius and the minimum 7 degree, an official of meteorological department said. Eighteen trains were running behind schedule due to thick fog. Visibility drew up to 50 metres and runway visibility was 125 metres. The minimum visibility requires to take off a plane is 150 metres that was why flights were either cancelled or rescheduled. Morning flights to Coimbatore, Bangalore, Mumbai, Shimla, Lucknow, Aurangabad, Jaipur and Chennai were delayed. An official of Indira Gandhi International Airport said that yesterday weather condition was better and the majority of the flights landed and took off timely. Fog again enveloped the national Capital last night when visibility dropped to 125 metres. But after 11 am, the weather improved and visibility increased. But still the flights, including Spicejet service to Kolkata, were delayed. An official of Northern Railways said that 40 Delhi-bound trains were running behind schedule for several hours. Among the late trains are Puri-New Delhi Purshottam Express, Rajendra Nagar (Patna)-New Delhi Rajdhani Express, Howrah-New Delhi Rajdhani Express and Kashi Vishwanath Express. Delhi-Hatia Swarana Jayanti Expres has been cancelled from today till the end of the month. Consequently, passengers were stranded at the railway platform. The Municipal Corporation of Delhi (MCD) asked for an early announcement of relief from sealing as the term of the Delhi Special Laws Provision Act expired on December 31. “People from different parts of country have been coming to Delhi since partition in search of their livelihood and have settled here, thereby increasing the pressure of housing. People have also carried out additional construction in their houses for their livelihood,” said Subhash Arya, leader of the House. “It is the inability of the government to maintain balance between demand and supply of housing and commercial spaces that has led people to additional construction and alteration of their houses,” he added. Arya accused the central government of cheating Delhiites by bringing temporary provisions for relief from sealing. He said that it doesn’t allow the civic body to sanction or regularise building plans and additional construction done before 2006. “We demanded to bring out a permanent solution by bringing one-time amnesty scheme so that additional constructions can be regularised and the areas falling therein could be given permanent relief from sealing,” he said. Arya added that this will enable the local body to carry out development works out of councillor’s fund, the property-owners could get their properties properly registered and their construction/would be construction could be sanctioned. The police received information on Sunday that three minor girls kidnapped from Sikkim have been kept in the Garhi area in East of Kailash. A raiding party managed to locate the house in Parkash Mohalla, in Garhi, where the girls were confined to a room by a woman, Srijana Subba Rai. A case of kidnapping has been registered in Sikkim regarding the girls. Further investigations are on. In another incident, the police rescued another 12-year-old Sikkimese girl from a house in East of Kailash and arrested Parlad Singh, owner of placement agency, Sky Group of Companies. According to experts, over 4.2 crore Indians suffer from thyroid problems - which they cite as the next diabetes. However, 90 per cent of those suffering from thyroid problems are unaware of their health condition. R.V. Jayakumar, chairman of the Indian Thyroid Society (ITS), said a part of the fault lay with the doctors who don’t communicate enough with their patients about thyroid problems, the risks, symptoms, diagnosis and treatment. “I don’t know whether the problem is lack of knowledge on the part of doctors, but the bottom line is that millions of people are walking around with thyroid problem, but they are not getting properly diagnosed and treated,” Jayakumar said. In order to increase awareness, ITS is observing the entire month of January as the ‘Think Thyroid’ month, said a press statement. He said women are eight times more prone to thyroid problems than men. “Difficulty in conceiving and recurrent miscarriages can be a symptom of underactive thyroid. Sadly many doctors do not routinely perform a complete thyroid evaluation in women experiencing fertility problems. Even more shocking, many women getting expensive infertility and assisted reproduction treatments have never even had a thyroid test,” he said.